The world of smart farming brings precise inventories, harvest predictions and fast disease control to your fingertips. Find out three ways the UX11 long-range drone will transform your agriculture business. New technologies, such as UAVs (Unmanned Aerial Vehicles), help agriculture businesses stay ahead of the competition. Due to the critical insights commercial UAVs bring to the running of an agricultural business, the compound annual growth rate (CAGR) of this market, from now until 2024, is expected to be 30.2%. Deloitte’s AgTech report demonstrated how yields on key crops still exhibit an improvement potential of 30%. It also underlined how the necessity of increasing production represents a great growth opportunity for industry players who can improve their efficiency. Inefficient crop monitoring is a problem for most farmers. But by using the UX11 AG, you work quickly to cover 150 hectares in one hour. The UX11 AG comes with a state-of-the-art inbuilt MicaSense RedEdge Multispectral Camera, which has five cameras: red, green, blue, red edge and near-infrared. Because of the red, green and blue cameras, it achieves a high-quality RGB composite, the equivalent to the vision of the human eye. 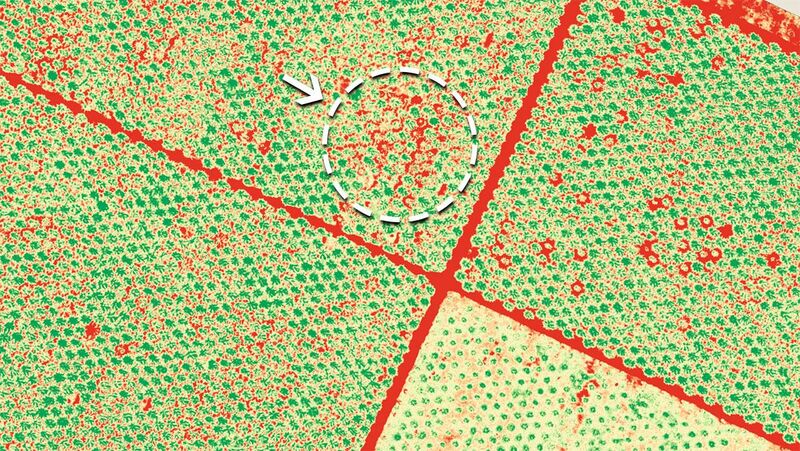 This blue layer can also identify bloom density or other crop traits, so it is particularly beneficial to fruit-tree growers who use it to predict how productive their harvest will be. The red edge and near-infrared bands reveal plant characteristics that are not visible to the human eye. By detecting chlorophyll levels, they can identify plant stress in the early stages. “The red edge band is the most sensitive to very early physiological changes of vegetation, and thus measures signals of health changes weeks before the eyes can see the effect on the leaves,” explains Grignard. “It is even more impactful for high canopy plants, like trees, which are a few metres from the ground. 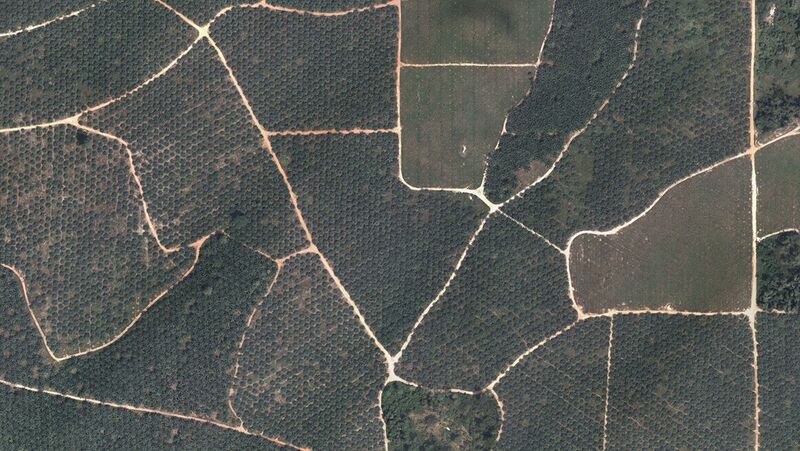 One of Delair’s clients owns a palm tree plantation. 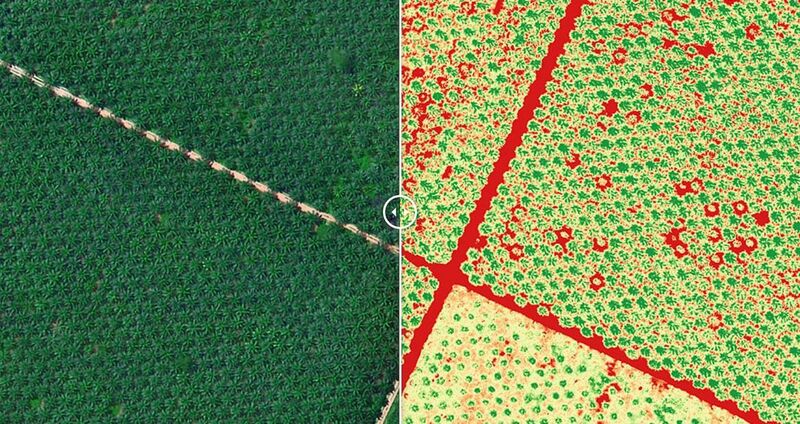 The RGB image (shown with slider) presents a field full of what look like healthy green palm trees, but the combined red edge and near-infrared sensors highlight an area (shown in red) where the palm trees are showing stress. “Pin-pointing stress at the plant level means agronomists can react quickly to avoid disease outbreak, nutrient deficiency and therefore yield impact,” says Grignard. Leading global corporations are undergoing digital transformations, putting data collection and analysis at the centre of their operations. Now agricultural businesses can do it too. As the UX11 AG flies for up to an hour, to a range of 47km, it makes the prospect of identifying and digitising every plant, over a short period of time, a feasible option for acquiring precise and cost-effective data sets. Open the UX11 AG datasheet. 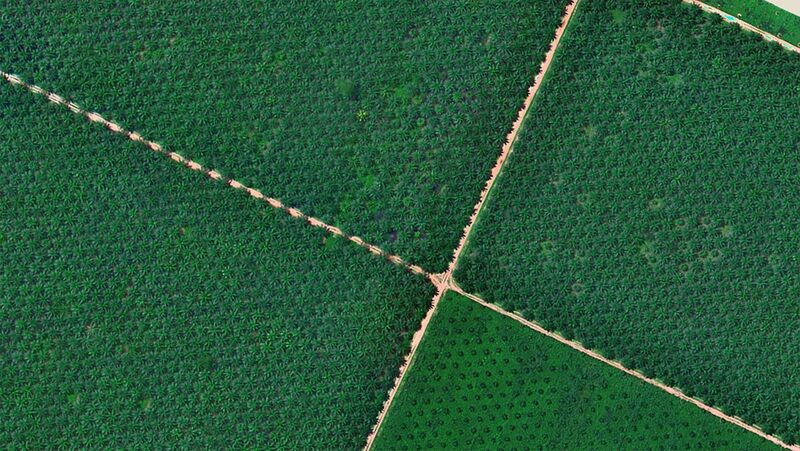 “This is the third dimension of data, the building up of temporal information that allows agronomists to track their plantation response to actions, assess their impact and build a reference database to increase overall plantation efficiency,” says Grignard. As Deloitte reports, tomorrow’s farmers need to deal with higher complexity and the fast-growing product and service offerings from different input providers along the value chain. This is why complexity-reducing products, like Delair’s end-to-end solution with the UX11 AG, are so crucial to explore now, so you can plan for integration later. The UX11 AG, with its multispectral sensor camera, can bring smart, analytic farming to your day-to-day operations and maximise your productivity in the future.